Hybrid Racing Autotensioning AC & Power Steering Removal Kit - Dezod Motorsports Inc - Home of the automotive performance enthusiast since 2002. 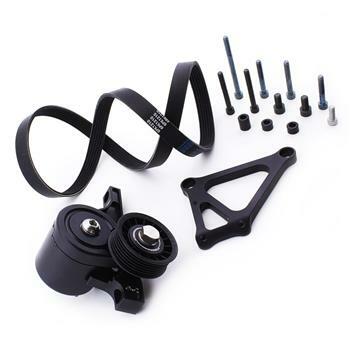 If you’re looking to gain some power by removing your car’s AC and power steering, but don’t want to lose the reliability and convenience of the factory belt tensioner, this is the kit for you. This kit moves the alternator to the AC compressor’s original location and features a spring-loaded, adjustable tensioning unit. The tensioner is designed to be able to be adjusted for belts within a 2” range meaning you have more options when you need a replacement belt. The tensioner has a tension indicator built in to help you insure your belt is properly tensioned.